Atrial fibrillation (AF) is the most common cardiac arrhythmia with an estimated number of 4.5 million patients in Europe. So there is a very strong interest for efficient and successful treatment methods for AF and other atrial arrhythmias. Personalized atrial models could give better insight into underlying mechanisms and improve treatment. However, determination of patient-individual parameters is challenging. In this project, special solutions were established to measure physiological parameters and validate simulation models. We developed an analysis technique for intracardiac electrograms to determine incidence direction and conduction velocity (CV) for a single excitation wave. From CT image data, a segmentation workflow creates patient-specific simulation models. 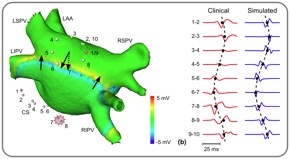 In these models, virtual catheter measurements are simulated and compared with clinical measurements to validate the model during different conditions such as sinus rhythm or controlled stimulation. Furthermore, phenomenological cell models were investigated. They are promising candidates for personalized simulations, because their limited parameter set can be adjusted in a controlled way to reproduce patient-specific behavior. Finally, electrical conductivities of different organs affect simulated ECGs. It was investigated which organs have the strongest influence and how ECGs for a wide range of tissue conductivities can be efficiently estimated from few sample simulations. These developments will contribute to include personalized atrial simulations in clinical practice. F. M. Weber et al. Adaptation of a minimal four-state cell model for reproducing atrial excitation properties, Proc. Computers in Cardiology, pp. 61–64, 2008.